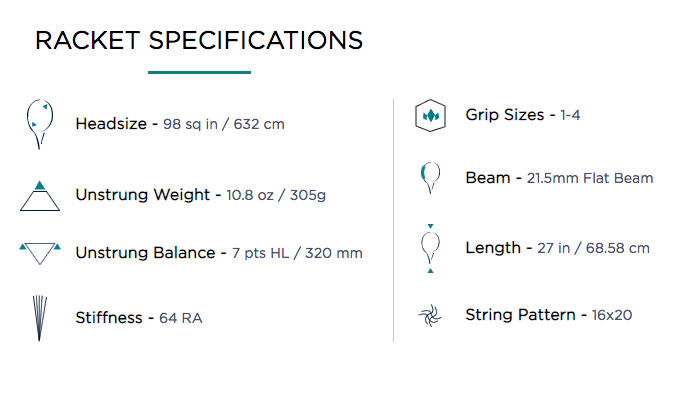 Diadem is an American company more focused on tennis strings. But with two new racquets, the Elevate and the Nova, they also enter the ultra-competitive tennis racquet market. I got to test the Elevate and below is my Diadem Elevate 98 racquet review. Becoming a player in the tennis racquet market is not easy. The competition from the major manufacturers such as Wilson, HEAD, and Babolat will make it hard to get your product seen. Especially since it is expensive for a new company to pay a top player to use your gear. Particularly when it comes to tennis racquets. With strings, it is a little bit easier. A company like Solinco has proved it possible to break through with a new product, and both Tour Bite and Hyper-G are now used by many pro’s and recreational players all over the world. Diadem has made inroads into this market as well with their Solstice Power string, but tennis racquets is a different story altogether. Diadem Elevate 98 is however not a bad racquet. It reminds me a lot about a HEAD Radical MP and plays quite close to the Youtek Radical MP , but with a bit more power and spin. Too much for my taste, but I imagine many players would enjoy this racquet. It is quite easy to use and at 305 grams unstrung it offers some room for customization. I ended up playing it with a leather grip and four grams of lead tape at 3 and 9. Also, tried adding some lead tape at 12, but the racquet became unwieldy and too powerful with that much weight in the hoop. I tested it strung both with Diadem Flash and Diadem Solstice Power 1.25 gauge. The Diadem Elevate 98 does not have a rare spec on the market. I have been harping on about the amount of 305 gram, 98 sq inch racquets on the market and here is another one. The picture is taken from the official Diadem website. What I do like about the spec is the mid-range stiffness (around 61-62 strung) and the 16×20 string pattern. I have said before that I really enjoy the 16×20 pattern as it is a good mix of control and spin. The racquet is definitely comfortable and still packs a good amount of pop. It does not come with a lot of technical hyperbole, but focuses on one main tech innovation which is called Impact Shield. Sort of like Babolat’s Cortex technology and is supposed to eliminate harmful vibrations. I felt no shock whatsoever playing this racquet with a poly so it can definitely be considered as rather arm-friendly. Thinking this is actually a good option for players who like the Wilson Blade 98 or Babolat Pure Strike, but want a slightly more comfortable response. The Diadem Elevate 98 did not really have a weakness. It felt good on pretty much every shot and I think there is a wide group of players who could enjoy playing with this stick. I like a bit more control from my racquets, so it is not something I would consider switching to, but I cannot think of any issues with the racquet either. It is simply a competent frame and a worthy contender to other 98 sq inch and 100 sq inch racquets on the market. Serve – I liked serving with this stick, I got plenty of power and it was easy to get the racquet to move fast through the contact zone. 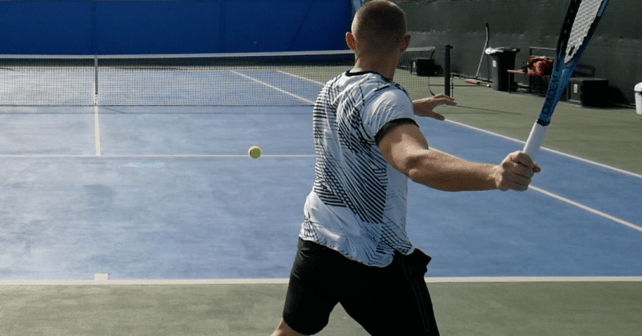 Groundstrokes – This is a good stick for baseliners who hit with a decent amount of spin. I felt the ball flying a bit on me when I went flat, but I also tend to gravitate towards 95 sq inch, 18×20 racquets so that is more on me than the racquet. Volleys – It does need that lead tape at 3 and 9 to feel stable at volleys. I still would have liked a bit more precision on my volleys, but I tend to go close to the lines and the power of the stick sometimes pushed them over. Diadem Elevate 98 Racquet Reviews – Who is it for? The Diadem Elevate 98 will work for a broad range of players. It is easy to use, offers room for customization, has a pretty forgiving sweet spot and decent feel. If you are a flat-hitting precision player, I would go for other racquets such as the Dunlop Srixon CX 200 Tour (click to read my review) or the Prince Phantom 93P. However, if you hit with spin and want a racquet that offers a nice blend of power, control and spin, I think you will enjoy the Diadem Elevate 98. I am impressed that the first racquet offering of a young company plays so competently, but I think it helped to imitate a popular mold such as the HEAD Radical MP. Not sure that is what they did, but they sure are pretty close. Obviously the room for innovation in tennis racquets is not huge, so it might be a coincidence but in this case, it was a good one. I also liked how they kept the stiffness low and opened up the string pattern to 16×20. So to summarize this Diadem Elevate 98 Racquet Review, I can only say I was positively surprised about the performance of this new racquet brand. We will see if creating a solid racquet for a wide audience is enough for success, but there is definitely plenty to like about this stick. Have you tried the Diadem Elevate 98? What do you think about this? If not, does the specs or design intrigue you? Please comment below. Thank you very much for your wonderful review. Please tell me the difference in the power, the control, the spin and the feelings compared with K7RED. Watched the video review and read the written version now. I can assume that this racquet is pretty close to the IG Youtek Radical MP right? But that has an 18×20 pattern making it a very control racquet and has been my main frame until I bought the Pure Strike 98 16×19. the Pure Strike lacks in the feel department idk why Babolat did that. Yes, it is close but more offers a bit more spin and power. The Diadem Elevate 98 offers a slightly lower launch angle, similar power level and a bit less spin. Control is about the same as well. The K7 Red has a bit better feel from the string bed, but that can be a matter of a taste. The Diadem feels crisper, while the K7 has a more noticeable flex. Hi has tested the nova ? I have only one prince exo3 tour 100 team, im 15 years old i want a similar racquet not for prince but with more weigth. My playstyle is baseliner very good 2hdbh and a forehand like zverev mediocre and good serve because im 6,3 ft of tall so help me and i want a thinner beam? Hi someone has tested the nova or elevate? I have only one prince exo3 tour 100 team, im 15 years old i want a similar racquet not for prince but with more weigth. My playstyle is baseliner very good 2hdbh and a forehand like zverev mediocre and good serve because im 6,3 ft of tall so help me and i want a thinner beam? I think the Elevate could work well for your game. It is quite an all-round racquet and you get more control than the Prince EXO3 Tour 100 Team. 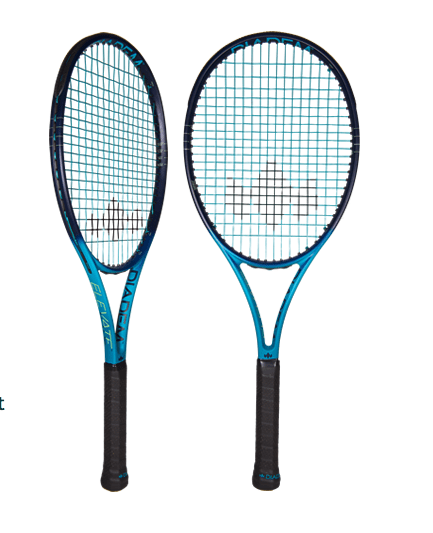 Hi you can compare this racquet with the beast 98 and vcore 98 im between this frames? The Beast and the Diadem play quite close since they are both 16×20. I would say the Beast is a bit crisper. But hard to say which one I would choose. The Diadem is definitely crisper, more powerful, has a lower launch angle. The K7 has slightly better feel (if you like flexible racquets) and more spin. Tough choice! How is it compared with Wilson Ultra Tour?